Ober Gatlinburg is a resort within a resort…within a resort town! The ski area is located on the pinnacle of Mt. Harrison, surrounded by a mountain of four season fun. Located at the foot of the ski area is an Alpine Slide, Wildlife Encounter, Water Raft Rides, Spider Web, Bungee Run, Amaze’n Maze, Chair Swing, Kiddie Land, Arcade and more! There’s a 62,000 square foot Tramway Mall, which hosts a beautiful ice skating rink, shops, dining and more. All of this is located three miles up Ski Mountain Road from downtown Gatlinburg. 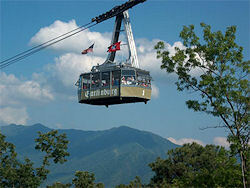 You can also take The Ober Gatlinburg Aerial Tramway which is one of America’s largest cable cars. It departs every twenty minutes from downtown Gatlinburg, going directly to Ober Gatlinburg All Seasons Amusement Park atop Mt. Harrison, and offers a magnificent panorama of Gatlinburg and the Smokies. For those unaware, Gatlinburg is in the heart of the popular Great Smoky Mountains and the resort town offers thousands of shops, festivals, and fun for the whole family. …And then there’s the ski resort. After all, that’s what this page is supposed to be about, right? In the true spirit of a real mountain community, Ober Gatlinburg Resort is outstanding in its approach to genuine hospitality, sensible pricing and comfortable accommodation. Stay close to the slopes in one of our cozy Ski Mountain Chalets Gatlinburg, or a luxury hotel in downtown Gatlinburg. With all amenities centrally located in this compact village, Ober is the perfect place to meet up with family and friends and have a real mountain winter vacation. 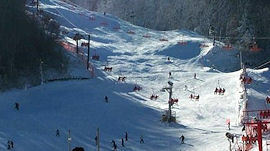 Ober Gatlinburg has nine ski trails serviced by two quads, one double and one surface lift and a Terrain Park. Snowmaking equipment blankets 100 percent of the slopes. They offer the Gatlinburg Snowsports Center, rentals, retail ski shop, restaurant, snack bars, a food court, cafe, and lounge. We even have an exciting Snow Tubing Park serviced by a Magic Carpet that offers 300 feet of exhilaration over a 50 foot vertical drop! Slopes are maintained with the latest in snow-grooming equipment to provide a smoother, more consistent surface, creating enjoyable skiing conditions. Things just keep getting better at Ober Gatlinburg! Ober Gatlinburg’s commitment to excellence brings some exciting new things to the table this year. Expect some serious snow in the Terrain Park this year as all snowmaking pipes were replaced prior to last season. The Terrain Park will also feature double the number of rails and boxes and this season expect more table tops and spines! The folks at Ober Gatlinburg also replaced the Red Lift cable and expanded and regraded the Ski School area. If you’re renting equipment during your next trip to Ober Gatlinburg, the rental fleet has expanded this year! The Rental Shop has added 50 new HEAD snowboards with rocker technology, 100 pairs of freestyle bindings, 120 pairs of snowboard boots and 50 pairs of HEAD BYS Skis! 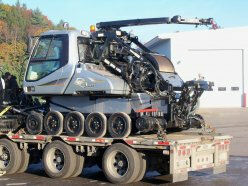 We have added a brand new Prinoth BR350 Sherpa winch snowcat to our grooming fleet. We’ve added a new retaining wall between Ski School and the Black Lift and created a new DELI called “LeConte Deli”! Snow making system upgrades continue this year. In addition to adding and replacing snow making pipe on Cub Way, we are also increasing our snow making capacity by rebuilding one of our holding ponds. 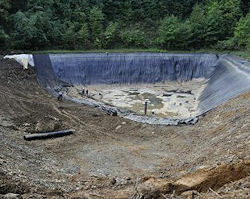 This will increase our overall water storage capacity to around 12,000,000 gallons! We are also continuing to improve our Ice Arena with a new cooling system that was implemented over the summer. This will make for an even better, more efficient ice rink! We have upgraded the boot storage for the snowboard rental area. Our new racks now dry the boots as the are being stored. This leads to happier feet for our snowboarders! We have also added new features to our terrain park. This year we add a 24′ flat box, 24′ double barrel flat rail, and a 10′ pole jam to our fleet of rails and boxes. We have also salvaged 2 oil drums and turned them into bonks. Our total jib count is up to 11 now! As mentioned above, Ober Gatlinburg could have perhaps the best Après Ski choices with thousands of shops, restaurants and night life. While downtown Gatlinburg is a bit more lively in the Spring, Summer and Autumn, there’s plenty to do all year long. With nearly 11,000 mountain accommodations, Gatlinburg has a place for everyone. Gatlinburg lodging offers affordable comfort, service and convenience with a heap of Southern Appalachian hospitality at each lodging venue. Lodging rentals in Gatlinburg include your choice of hotels, motels, lodges, inns, condominiums, cabins, chalets and bed & breakfasts ranging from rustic charm to penthouse elegance.